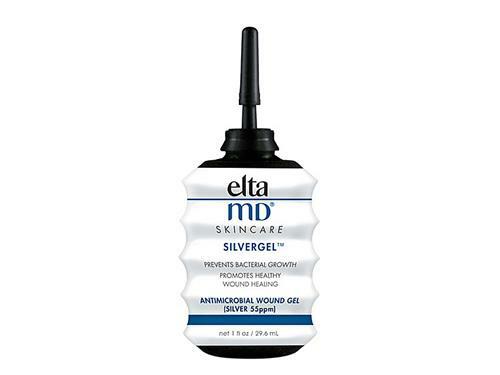 Accelerate skin healing with EltaMD SilverGel. This crystal clear wound dressing gel helps abrasions, minor burns, superficial cuts and other skin irritations heal more quickly. EltaMD SilverGel creates the moist environment your skin needs in order to heal, with soothing glycerin and naturally antimicrobial silver. This gel prevents bacterial growth to avoid the risk of infection and can be applied easily as often as needed to keep the area moist and promote healthy healing. Tell us your thoughts about EltaMD SilverGel and receive 50 rewards points! This is super healing and very anti-microbial. It works for any type of irritation and I especially love it on breakouts because they heal without scars or marks. I buy these three at a time and will not be without. I've tried other silver gels, but this is the best. Definitely helps my acne heal faster. Helps the deeper pimples flatten quicker too. I would definitely recommend. I don't know how I never tried this but so glad that I did. At age 61, with very sensitive, ageing skin, and yes, I still have bad breakouts this has been an amazing product to heal my skin quicker. I am so glad I tried this, and I will be purchasing this again and again. This is great if you have a flair up to try to control it from getting infected. I have multiple uses for this silver gel. It heals cuts and scrapes faster than OTC triple antibiotic ointments you get at the store and it prevents infections. It reduces the size of cystic acne to nearly nothing in three days vs. 7-14 days without it. I will always keep this stocked in my medicine cabinet. I really like this product and its healing qualities! Used it recently on an inflamed cuticle and after a couple of applications–no more! I'm very pleased with the SilverGel. It's great for minor facial skin issues, and I've also used it on my hands and arms due to gardening scrapes. It's soothing and light and disappears into skin. I have sensitive skin and seasonal allergies, and this is a great product to keep on hand. This product and formula is amazing. One of the best all-around products for wounds, acne, and cuts. My husband loves this as well. This bottle lasts forever. A staple for skin care and emergency kits! An esthetician told me about this product and its effectiveness on acne. The product description doesn’t specifically mention this attribute but it actually does wonders to stop and/or lessen breakouts when they start. I always keep a bottle on hand. This is an awesome product. It heals acne, bumps, and is great for the skin. I had shingles, and it soothed and helped keep my face clear and felt good.